As the first choice for bath remodeling companies in Northwest Texas and Southwest Oklahoma, Luxury Bath Texoma strives to provide the best customer service and bath products in the industry. Whether you need to replace your existing tub and shower or you want to do a full-service bath remodel, our expert team has the experience to get the job done right! We offer each of our customers a full, in-home design consultation to help you find the perfect products for your bathroom space – at no cost to you! From there, Luxury Bath Texoma will custom design a new tub or shower surround that fits right over your existing unit. It means a no-mess install that can be done in just two days to keep your busy life on track! Two Day Baths – Our exclusive two-day bath update will give your bathroom a luxurious overall look to make any size space a relaxing oasis! Bathroom Renovations – Our professional install team will be with you every step of way to help you bring your bathroom vision to life! 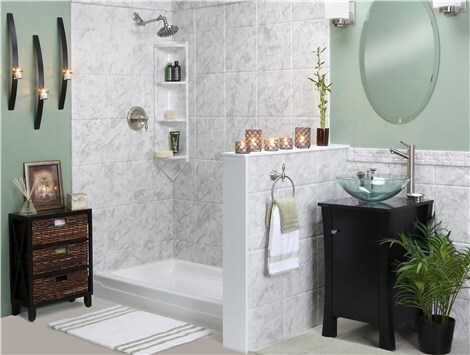 The selection of products at Luxury Bath Texoma is second to none! 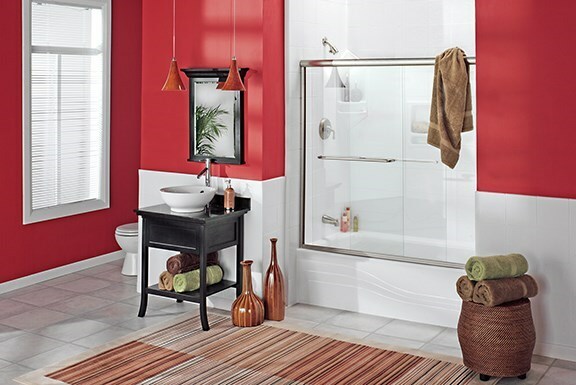 Not only do we offer high-quality tubs and showers in a variety of styles, we also have an expansive selection of accessories and hardware that can add a luxurious touch to any size space! Luxury Bath Texoma cares about the environment and makes every effort to reduce our carbon footprint. That’s why all of our SimplePure bath and shower systems are 100% recyclable with most fitting right over your existing unit. Even the LuxBond permanent adhesive used in our renovations is an all-natural and organic compound! Not only do we believe in green products, we also believe in environmentally responsible business practices. That’s why our bath remodeling company has instituted a GreenTeam to implement company-wide environmentally responsible choices! Microban Technology – Our durable acrylic materials are infused with Microban for easy cleaning, low-maintenance bathrooms designed to protect your family from unwanted germs. Anti-Chip, Durable Acrylic – The tubs and showers from Luxury Bath Texoma are made from innovative, multi-layer acrylic that will stand up beautifully to the test of time. LuxSeal Treatment – All of our exclusive shower doors are treated with LuxSeal glass treatment – an exceptional product that reduces the need to clean glass by 90% by reducing hard water and mineral deposits! For over 25 years, Luxury Bath Texoma has been manufacturing, selling, and installing bathroom remodeling products that make your life safer and easier. We believe every bathroom should be fresh, clean, and pure, which is why we developed our own innovative line of exclusive SimplyPure bath products that can turn any space into a spa-like retreat. With the quality products and two-day installation services from Luxury Bath, we guarantee that your customized bath remodel will make your bathroom the showpiece of your home!